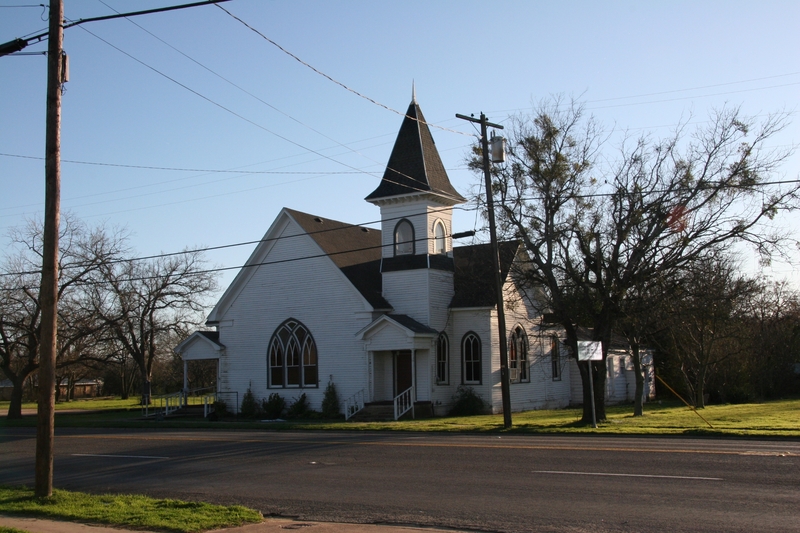 The story of the division of “The Christian Church of McGregor” in McGregor, Texas, near Waco, is of particular significance for several reasons. Organized on August 25, 1883, it divided on September 23, 1897. 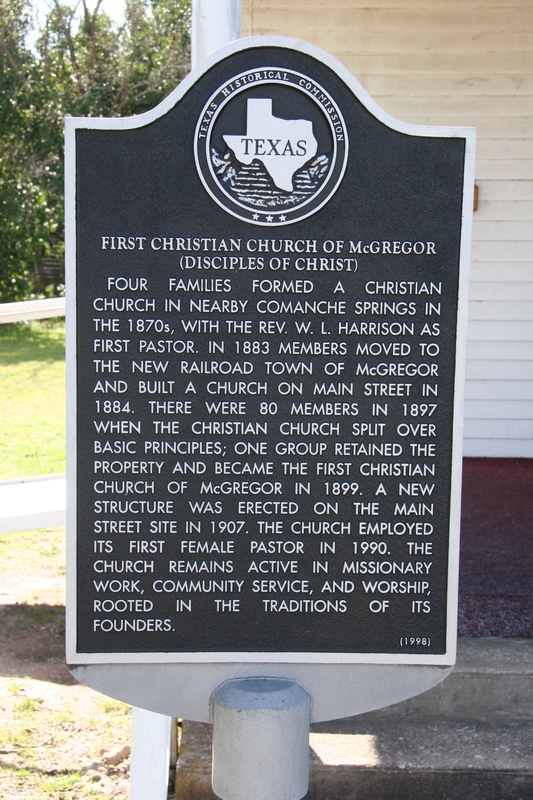 The division resulted in two groups: “The First Christian Church of McGregor” and “the Church of Christ” (the capital letters are conservatives own self-designation). The conservatives changed the locks on the building and prevented progressives from meeting in it. The progressives filed suit which was ultimately decided in favor of the progressives by the Supreme Court of Texas. The story is told in W. K. Homan’s The Church on Trial or the Old Faith Vindicated (1900). You can read the court decision here. The rebaptism question, whether one must believe that baptism is for salvation (“for the remission of sins”) in order to be scripturally baptized, was one of the significant issues in the division and in the court trial. Some edlers refused to admit into membership those who had been previously immersed on faith in Christ. Elder R. M. Peace stated at the trial that “if one should present himself for membership in the church of which I am an elder, stating that he believed baptism to be because of the remission of sins, and not for an in order to the remission of sins, I would not regard him as a Christian” (Holman, p. 52). Peace explained that they “would receive persons baptized by preachers of other religious bodies, if they had been immersed for the remission of sins—that is, if they believed at the time of their baptism that baptism was for the remission of sins.” And though his lawyers were Baptists, Peace further remarked that “We do not recognize Baptists as Christians” (Holman, p. 50). What becomes obvious in this trial is that rebaptism was applied as a test of fellowship by Trott and others. Under cross-examination, Trott made this very clear as the extended quote below demonstrates (Holman, pp. 54-55). I belong to the Church of Christ. Do not belong to the Christian Church…I would not hold membership in a church were such things are practiced music, missionary societies, conventions, etc. I regard all who engage in such things as in sin. I agree with what is called the Firm Foundation faction…..It is the view of those called the Firm Foundation faction that no one has been scripturally baptized unless he understood at the time of his baptism that baptism is for, that is in order to, the remission of sins. They do not regard as Christians those who did not so understand and believe at the time of their baptism…I do not regard Baptists, Methodists or Presbyterians as Christians, because they have not been immersed for the remission of sins—that is, with the understanding on their part that baptism is for the remission of sins. Should I find persons holding membership in the church who did not believe at the time of their baptism that baptism is for the remission of sins, I would insist upon withdrawing from them—that is, excluding them from the church. It is a fact that I found three such persons in the church at Rising Star, Texas, where I preached, and I advised the church to exclude them, and they were excluded on the sole ground that at the time of their baptism they did not believe that baptism is for the remission of sins. Trott locked the doors of the building against the progressives partly because they would admit people to the church whom he did not believe were Christians and partly because they supported a visiting Christian Church evangelist, B. B. Sanders, in a recent revival. Up to that point, the church had not used the organ or participated as a corporate body in the conventions and societies, though some members did as individuals (for which they were rebuked but not excluded). The court case was largely argued in reference to the rebaptism question, though other issues were present and the practice of the “innovations” quickly emerged after the division of the church into two groups. Historically, this points to the intense convictions held by some on the rebaptism question and their divisive—even sectarian—nature. Were David Lipscomb and Trott to serve the same congregation as elders, the church would divide because Lipscomb would admit those immersed upon faith in Jesus whereas Trott could not hold membership in a congregation that did such. This entry was posted on March 4, 2010 at 9:38 am	and is filed under Stone-Campbell. Tagged: David Lipscomb, Division, Firm Foundation, G. A. Trott, Holman, McGregor, Rebaptism, Stone-Campbell, Tenessee Tradition, Texas Tradition, Unity. You can follow any responses to this entry through the RSS 2.0 feed. You can leave a response, or trackback from your own site. It appears to me that the segment of our movement that holds to the FF perspective described above is declining. Do you think this is correct? And do you see a trajectory for the growth/decline of the FF position over the next 10-20 years based on the current state? My experience leads me to think millenials, for example, are running in droves away from this viewpoint (of course this could be motivated more out or a desire to be non-judgmental/tolerant than action informed by biblical study, which should concern all of us). Thanks for sharing this bit of our history. I was unware of it. Thanks for another interesting and informative post. I suppose Alexander Campbell would not have been recognized as a Christian at that particular congregation. As to the Baptist lawyers, I assume they were paid to do this job and were simply performing the work they were paid to do. OTOH, there is something in me that wonders if they did this (in part) thinking it would eventually bring shame and embarrassment on the Church of Christ. Perhaps I have too vivid an imagination. Woe unto you, lawyers! for ye have taken away the key of knowledge; ye entered not in yourselves, and them that were entering in ye hindered. (Luke 11:52 KJV). Too many times, humanity is involved in THEIR own versions or interpretation of the scriptures and take away the true meaning of salvation through Christ Jesus. Jesus Himself says, “Verily, verily I say unto thee, except a man be reborn of water and the Spirit, he cannot enter into the Kingdom of God (John 3:5 KJV). Jesus Christ last commandment to all disciples, as He ascended into heaven was this; “Go ye therefore, and teach all nations, baptizing them in the name of the Father, and of the Son, and of the Holy Ghost.” (Matthew 28:19). Jesus also tells us to beware of the leaven of The Pharisees (lawyers of that time of the law), which He meant the doctrine of the Pharisees (Matthew 16:6). The above scriptures reminds me of these disputations you are all having about baptism, taking away the true meaning of baptism, which is the acceptance of Our Savior, that is through His baptism, which takers away the sins of the world. The old man is buried in that water, and we are resurrected into Christ through His baptism. The Pharisees would criticize Christ Jesus because His disciples would not follow the tradition of Moses as of the washing of hands before eating, whom Christ replied,”howbeit in vain do they worship me, teaching for doctrines the commandments of men. For laying aside the commandment of God, ye hold the tradition of men, as the washing of pots and cups; and many other such like things ye do. (Mark 7:7-8). Please don’t be like these lawyers and put a stumbling block to people that want to be baptized into Christ Jesus! May the peace of our Lord Jesus Christ be multiplied in all Christians through His undying love for us all. I was raised in this congregation. Well, not literally but conflict and uncharitable actions that followed sound much like the congregation I was raised in. Thankfully that congregation has changed some, placing a value of love/charity (cf. 1 Cor 13) over enforcing a strict dogman by means of unethical behavior. Fortunately, I see that same change in values emerging in many other Churches of Christ. Just wondering if you have ever given thought to writing a book on the historical theology of the Churches of Christ? I assume that such a book would parallel our historical development in many ways but would also be different than just a history of our movement (e.g., Hughes, “Reviving the Ancient Faith”). Thanks for your continuous work and faith. I really appreciate all you do. Fascinating. While I’m working on my M.Div at OK Xstn, I’m preaching at a small church where they do not believe in the indwelling of the HS. Increasingly I find that I can turn to the CofC history of the late 19th and early 20th centuries for answers to these interesting theological “positions” I am encountering. So thankful for your blog. i can’t even and don’t even talk to my relitives any more.for more reasons than that, i for the most part was the black sheep in the faimly. and i am thankful for that in more ways than i care to speak on. I’m torn between the fact that I find the history interesting reading, and the embarrassment at the “stuff” that get’s preached in the name of God. well some ideas just don’t make good nonsence,any longer for me. also by the looks of your beard david your personal journey on the path of life is littered with good intenshions and theological ideas that added up to a sum total of imbarrsssment. No? Through Baptism we are freed from sin and reborn as sons of God.